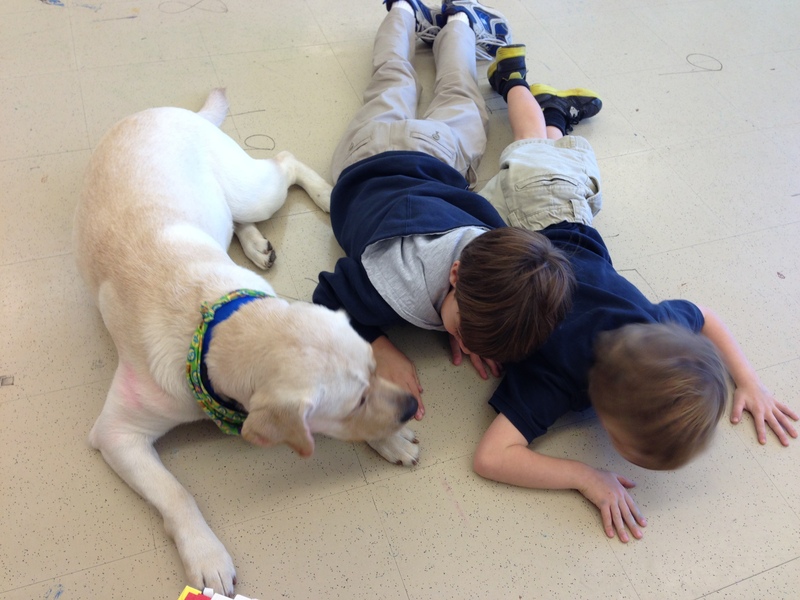 It is tough (but awesome) being a dog in the art room! There are some constants in the art room at Trinity. To name a few; teachers, students, crayons, paint, glue, markers, oil pastels and a big yellow lab! The constants remind me of a song from my childhood, “One of these things doesn’t belong here…” (seems pretty Sesame Street-ish but I can’t be sure). The thing that doesn’t seem to belong is the big yellow lab but there he is every day mixing it up with the art students! From Kindergarten artists to 8th grade studio participants, Cisco pads over to explore their creative process. You can see in the photo above, Cisco takes the blank canvas seriously and wanted to make sure the 7th graders that needed to turn that large canvas into the backdrop for a 2nd grade musical knew he was there to help! As the girls started designing and paint, Cisco made sure that he padded through the wet blue paint, making sure that he left a few paw prints so everyone would know he helped. 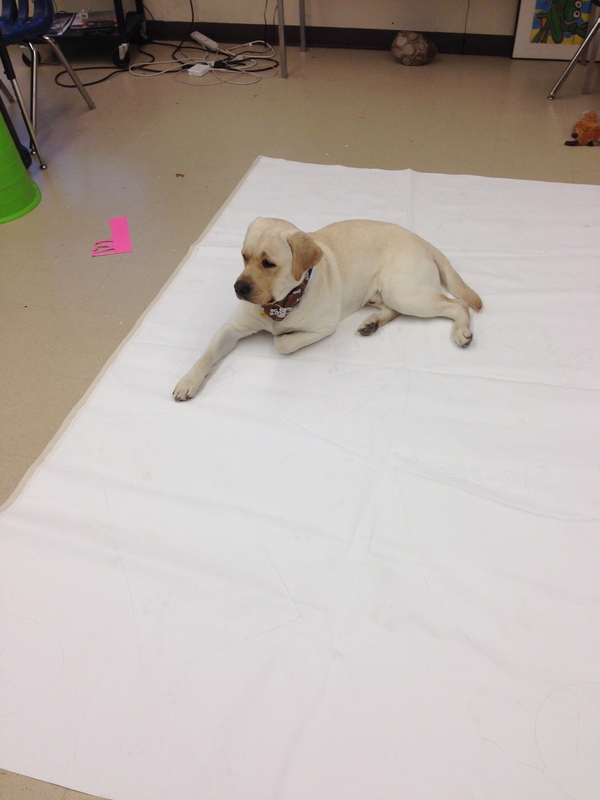 That is simply how it rolls in the art room with a big yellow lab and the students just remind him to “get off the canvas”, they do not cry, get mad or start over. When it comes to art materials, Cisco is a bit of a connoisseur! Personally, I love a good Sharpie over an off-brand permanent marker so I feel that I am a bit of a material connoisseur but Cisco takes a different angle. Cisco eats the materials that make it to the floor (and anyone that has been in an elementary or middle school art room knows that a fair amount of the supplies hit the floor!). He has a special place in his diet for crayons and oil pastels but will give it all up for a nice plastic glue stick. I bet he eats about 15 crayons a week and each one makes a colorful reappearance in the back yard! A few months ago during one of his “counter surfing” phases he picked up a bowl as gently as a trained retriever. If it was a duck, hunters would be proud of the care he took. It was not a duck but rather a bowl of green paint. As Cisco trotted to show off his “catch” he lifted his head and dumped the entire bowl over his snout and head! We all laughed HARD and Cisco just shook off the excess and went about his business. Every day Cisco wears a bit of his job home…pink chalk down his side, blue paint on his ear, or black printing ink on his leg, all worn with pride by the art room dog! In addition to being a material connoisseur, Cisco is a wonderful muse! Students LOVE to draw, paint, collage, sculpt, and photograph him. 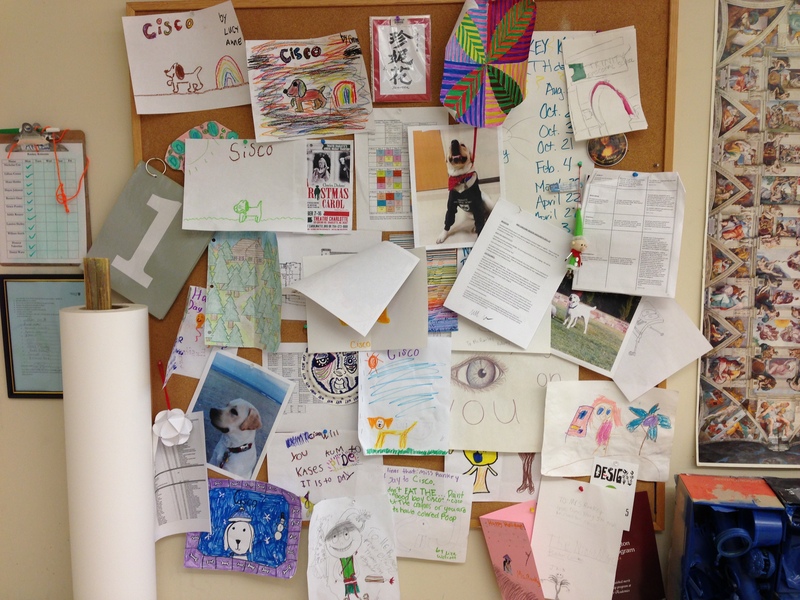 Here is a snapshot of the bulletin board in the art room…a close look will show you that majority of the board is dedicated to sweet Cisco! This drawing was on the back of a 6th grade boys mid-trimester self-reflection. The drawing is of Cisco wearing his Trinity hoodie with the hood up (yes, he has a sweatshirt that he lets me put on him because he is THAT good!). Love the imagination he added with the fangs and nails…a true look into the mind of a sixth grade boy! I could go deep into my “art teacher philosophy” that this drawing symbolizes the visual maturity yet subject naivety of the 6th grade artist but instead I would like to just smile and cherish this little drawing doodled on the back of a young artists self-reflection! Keep doodling but don’t eat the crayons…Cisco will get ’em! P.S. We will get back to our daily schedule soon. We left off at 8:10 am so there is still ALOT of day to document:). The question I get most about Cisco and his school-dog work is, “What does a school dog do?” What is most interesting about this question is the fact that the answer seems to change every day. Well, not really change but rather become more clear! Cisco works in ways that defy definition, ways that are so subtle and undetectable that they can go completely unnoticed. Although he punches a clock (because his work is done in a very “human” manner) he doesn’t really fit into any job description. I think the best way to explain his work is to walk you through a normal day for Cisco. Now those of you that work in a school, you know that “normal” is completely subjective and there is rarely a “normal” day! We rise and shine at about 5 am. Cisco exits his crate with a smile and more joy than I can handle most mornings. 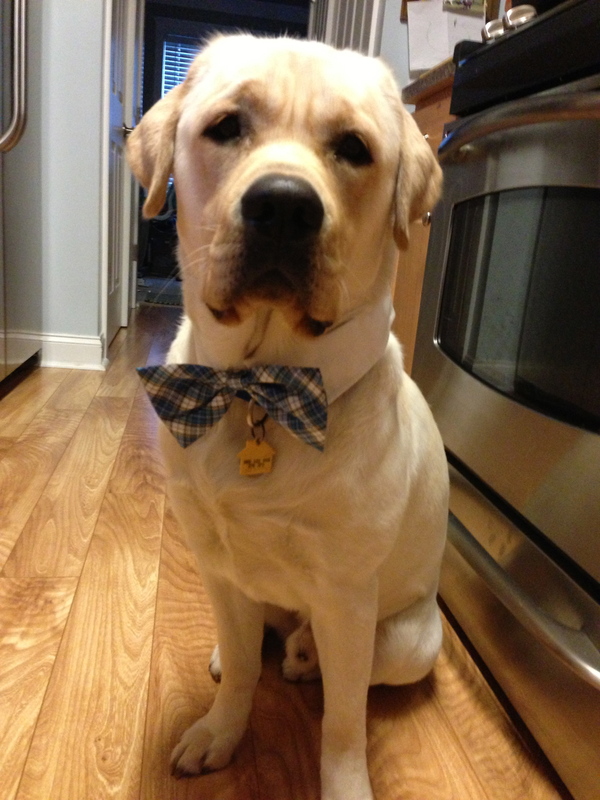 He quickly reminds you that it is time to eat because after all, he is a lab and his life revolves around food! He plays with his toys while I choke down a much needed cup of coffee. We then wander upstair to “get ready”. Cisco waits for me to finish my shower and dressing by patiently lying on the rug in the bathroom. His placement means that I have to step over him about 400 times before I say, “OK, are you ready?” which is his cue to run downstairs and sit by the hook that hold his leash and uniform (a stylish bowtie or bandana). When the bandana slips over his head he clicks in to “working” mode. Then we are off to start another day with a quick jump into the back of the car! Once we arrive at school we park about a block and a half away so that Cisco can do all his doggie business before we get to campus. Once we cross the street and enter the school campus our pace slows to a crawl because everyone wants to say good morning to Cisco and Cisco wants to say good morning to EVERYONE! Once we get in the front door Cisco knows what he wants to do. He quietly comes along while I check the message board and my teacher box, giving every adult he comes across a loving “good morning”. Then we head to the 3rd floor and he really gets to work. At the top of the stairs I slip off his leash and open the door. He trotts down the hall looking in to each classroom, sometimes stopping to check out what is going on but his main objective is to get around the corner and to one of the middle school Language Arts rooms. This classroom serves as the meeting place for a group of boys. They come in early to work with the teacher and have some good “guy time” before the official school day begins and Cisco LOVES this daily “guy time” meeting. He gives me a quick look then dips in to cheers from the boys! Cheers that include “Cisco!” and “Cisco is here, pick up your lunch boxes!” The door clicks shut and the boys PLAY!! I head on down the hall to my classroom and can hear laughter and barking, really I can hear joy pouring from the room at the ripe hour of 7:30 am! At about 7:50, he heads to my (HIS) classroom followed by a few young men who never fail to say “Thanks Ms. Rankey!”. Cisco grabs a quick drink then greets the members of the Rankey Koinonia (my advisory group consisting of 11 6th through 8th grade students). At about 8:10, Cisco bids them farewell and settles in the corner of the hallway, greeting all the middle school students headed to their first class. As you can see, Cisco is a busy boy since this is just the beginning of each day! I must confess that as I actually write down the activities of his day I am impressed with his work ethic and understand why he is so tired when he gets home! I feel confident that these morning times are some of his favorite throughout the day and I feel confident that his presence for some of those middle school students is more important than even they know. 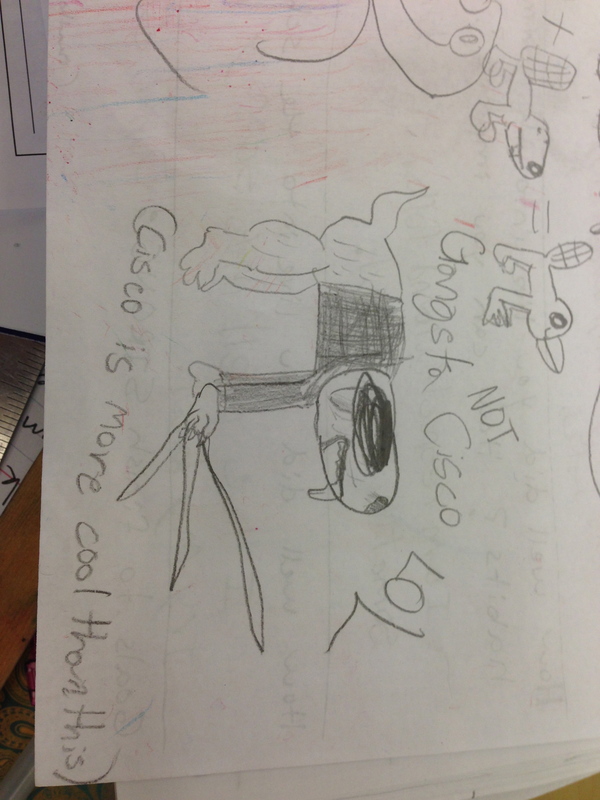 Here is the cool thing about Cisco, he doesn’t care what you look like, what brand shoes you are wearing or who your friends are, he just cares about you. This is exactly what every middle school student needs to kick off each day and I am humbled that I get to stand next to him while he “works” for the students. Since we are only to about 8:15 am, I will save the rest of his day for another post! But know this, each day he does work that no human can do. He quells anxiety in a way that simply amazes me, he settles a room with ease and breaks tension like no other. He knows when to play and when to settle with little direction from me and he reminds me that sometimes you just need to relax and take a deep breath! Until next time, keep your tail wagging and smile! As Cisco sat down to do his first blogpost of the year he was presented with the unnerving fact that he is a bit of a slacker when it comes to posting! He found four unfinished posts but nothing actually published since September…simply shameful! Of course we all know that this is not his fault since he lacks thumbs and the ability to type for himself but rather my fault for letting time slip away. Well, I convinced Cisco to “buy-in” to the convention of making a resolution to change something during the upcoming year. He reminded me that he can’t do it without my help so we have both resolved to be better bloggers! We decided to give you a funny little story to get back in your good graces, hoping that you will reconnect with us and our work. On December 21st, Cisco started his first Christmas break. Seemed like every other week to him, sheer exhaustion by Friday afternoon but the change was that instead of crashing on the couch around 6 pm he headed to his second favorite place, The Dog Knowledge. This is where he goes to be a DOG, not a school dog or a working dog but rather a DOG dog! Little did he know that he was staying at TDK for 10 days while I traveled to visit family and friends on both coasts. After visiting and celebrating with MANY loved ones, I exited the airport after taking the red-eye from San Francisco and went to get the big boy! 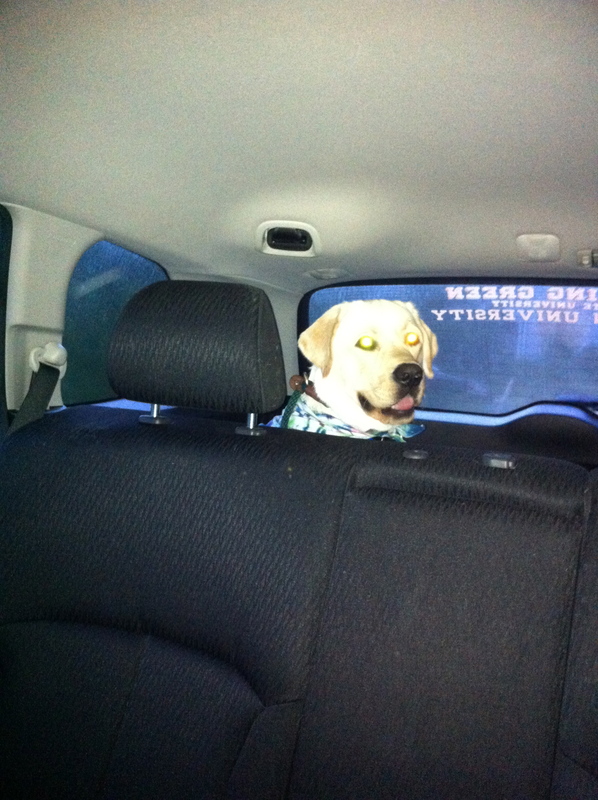 His sister Madaket came barreling out and jumped in the car, ready to get the hell home, leaving Cisco to sniff and wonder. Then he spotted me and came running across the parking lot and simply launched himself. I’m not sure if he was launching towards the car, Madaket or me but he ended up half in the car and half in my arms. Happy with where he landed he gave me 10 days worth of doggie kisses and his tail would not stop wagging…ahhh, we would all soon be home! We all then proceded to sleep for about 3 days…AHHHH! As the new year rolled around I found that it was time for me to go back to school. We had faculty work days on January 3rd and 4th. Work days are usually full of meetings and lack the presence of kids so Cisco usually skips them but I decided to let him gradually work his way back into a school schedule with the rest of the faculty. Of course, everyone was super happy to see his sweet face. It still amazes me what the presence of a dog can do to a group of people! I went to one side of the dinning room to put my bag down and take off my coat. Cisco wanted to wander around and greet everyone so I slipped his leash off and turned my head to greet a colleague. Out of the corner of my eye I saw Cisco take off like his tail was on fire! He was tearing through the dinning room at top speed and before I could even figure out was going on he rounded the corner, found the snack table and helped himself to a dog-sized mouthful of yummy breakfast muffins. He cut right in between two civilized humans waiting their turn for muffins….as with so many times before, I held my breath and waited for the human reaction. The shocked look on the faces of all those around were replaced with hearty laughter! How can you not laugh at a big yellow lab smiling at you through a mouth full of poppy seed muffins? We were BACK!!! So, we resolve to be better bloggers, we resolve to love a little bit harder this year and we resolve to run like there are poppy seed muffins and smile like we just helped ourselves to a mouthful! 2016: Year of the Cisco Puppies! Seriously, how cool is this?!?! ?